When I went vegan, my family didn’t make the change with me, but I insisted upon one thing—no dairy. I banned it from the house after learning about the atrocities of dairy farming and the awful ingredients in milk. I immediately replaced our cow’s milk with plant-based milk and dairy butter with vegan butter. I found butter to be one of the easiest dairy-free switch-outs you can make in your fridge. With the abundance and quality of products in the marketplace today, you can easily replace it without tasting the difference. I promise! And you can bake without it too! Whether you need something to spread on a dairy-free grilled cheese, blend with sugar in a frosting, or melt on a baked potato, this guide to vegan butter has got you covered! This is the go-to dairy-free butter in my house—and it’s one of the most widely available! 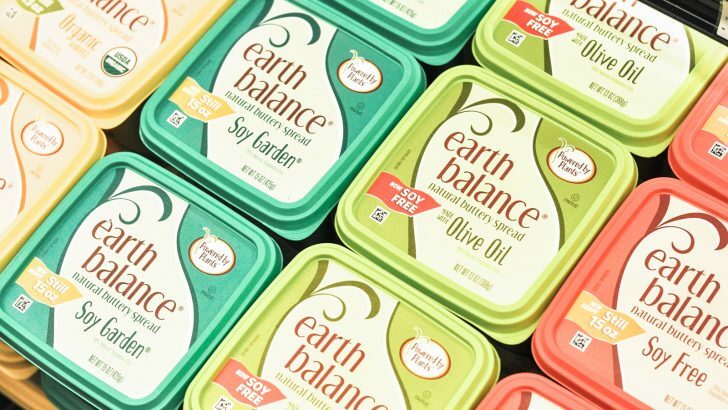 Earth Balance vegan butter tastes just as great as butter…even better, in my opinion! They have dozens of varieties…they even have an avocado oil butter! You can’t go wrong with any of the Earth Balance line of dairy-free butters, but when it comes to baking, their butter (and shortening) sticks replace the dairy versions with ease and delicious taste. Brace your taste buds for this creamy butter. This is the good stuff so you want to use it where you are really going to taste it. I use it as a premium spread when I have a high-quality baguette or am making a special piece of toast. It will elevate anything you spread it on. It’s organic, non-GMO, and made without palm oil. It’s quickly becoming more accessible and can now even be found at Trader Joe’s! Miyoko’s vegan butter is also my go-to for popcorn. Melt a few pats and drizzle it over a freshly popped batch of kernels along with a few pinches of sea salt and a generous sprinkling of nutritional yeast for a game changer. It’s equally delicious slathered on freshly grilled corn on the cob. This rich and creamy organic spread is a favorite among many. It uses a blend of fruit and plant-based oils. Melt also recently launched vegan butter sticks that are optimized for baking with oils that are not high in omega 6 ALA’s (such as soybean, canola, and safflower). This spread has been around forever and is available at just about any mass grocery store. This notorious brand recently came out with a vegan version of their butter spread. It’s 100% non-dairy and Vegan Action Certified. This a versatile, all-purpose cooking oil, but also doubles as a delicious butter alternative. If you want to keep things really simple you can use refined coconut oil in place of butter. Don’t worry, the “refined” kind doesn’t actually have any coconut flavor! Coconut oil is solid at room temperature, and liquid when heated, so you can melt this spreadable oil on hot toast. Note that you’ll want to sprinkle some salt on top to get that true buttery vibe as butter is traditionally loaded with salt and coconut oil doesn’t have any. 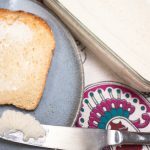 If DIY is your thing, we’ve got a simple vegan butter recipe by chef Allison Rivers Samson from The Dairy-Freedom Cookbook for you. It’s easier to do than you’d think! Ready to venture beyond the land of store-bought butters and unflavored coconut oil? Once you’ve got the ingredients, making this easy-to-spread butter is a snap. Slather it up! Place a glass container in the freezer to chill while preparing the Better Butter. Lecithin is used to emulsify or combine the ingredients. Although lecithin is most commonly made from soy, sunflower lecithin is becoming more popular. Look for it in the supplement section of health food stores, or online (see link below). This is a soft, spreadable butter. If you'd like something harder, decrease the sunflower or safflower oil and increase the coconut oil. You can start with 3⁄4 cup sunflower or safflower and 1 cup coconut oil, and adjust by the tablespoon until you get your preferred texture. Just make sure that the total of both oils always equals 1 3⁄4 cup. You can find sunflower lecithin powder here, and refined coconut oil here. With so many options, your only challenge is which to try first! Have fun with it—and enjoy! For more family-friendly vegan tips and recipes from Stephanie Dreyer, subscribe to her newsletter here. This article contains affiliate links which help us keep the lights on at World of Vegan. This post is not sponsored, and we only share products and companies we sincerely adore!